The Republic of Srpska, one of the two constituent self-governing regions of the dysfunctional state of Bosnia and Herzegovina, will hold elections on October 7. The electoral process will take place under the long shadow of Western political manipulation designed to influence its outcome. On the one hand, there is the unsolved murder back in March of this year of a politically insignificant young man, causing widespread agitation with vague and, so far, totally unsubstantiated allegations of government complicity in the crime. On the other, credible claims have been made that Republic of Srpska’s main opposition coalition alliance is being funded by the US and UK. Both developments, of course, are right out of Gene Sharp’s manual of political warfare by other means, known as “orange revolution”. The mysterious demise of 21-year-old David Dragičević, a student with no apparent political links, which has been clumsily mishandled by investigative authorities, has been used for months as a convenient rallying cry by anti-government activists. As for the under-the-table financial and logistical support extended to opponents of Russia-friendly President Milorad Dodik, these are not just casual political claims disseminated for campaign purposes. USAID and other outfits tied to the US and British governments make no secret of the fact that they are injecting funds into the Republic of Srpska, particularly the media and political groups friendly to their agenda, in order to tip the balance in their favor and detach the Republic of Srpska from “malign Russian influence.” Rules of electoral non-interference boldly asserted for the benefit of hegemonic countries apparently do not apply to the behavior of the hegemons. As a result, the Republic of Srpska is in the throes of the second round of the color revolution which was originally attempted and failed four years ago at the time of the previous general elections in 2014. The threat is acute, not just to Dodik’s leadership but more importantly to the existence of the Republic of Srpska. Western minions are being funded and covertly supported because they have agreed to revise the 1995 Dayton agreement and to accept the concept of a unitary Bosnian state that would eliminate or eviscerate the Republic of Srpska. They have also agreed to drop Srpska’s veto to NATO membership for Bosnia. But while Dodik’s position on these key issues is sound, his rule has been undermined significantly by the corruption and incompetence of his government. These shortcomings have given the pro-NATO and anti-Russian opposition legitimate issues on which to focus and draw votes that they would otherwise not get based on the flawed fundamental policies that they are hired to advocate. Unfortunately, as has happened so many times in the past, the Serbian people do not have a real choice between good and bad options, but mostly between different shades of bad. New and dynamic political forces, such as the “Successful Srpska” movement, for instance, which consists of young, patriotic professionals untainted by corruption or scandal, are short on resources and media coverage. It is not a level playing field. Fresh, honest faces are at a disadvantage compared to the corrupt political dinosaurs from the past who have nothing to offer but empty rhetoric and, in some cases, also extremely bad policies. Bosnia is a failed state. It was set up as an international protectorate on permanent artificial respiration and that is what it has been ever since the signing of the Dayton Peace Agreement in 1995, ending the civil war. 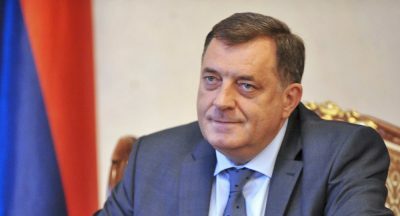 President Dodik has hinted at organizing an independence referendum or joining Serbia if Kosovo’s illegal secession from Serbia receives international recognition. But the real question is what all three constituent communities in Bosnia, not just the Serbs, would do after Bosnia’s inevitable demise. There is scant evidence that Dodik ever actually gave serious thought to secession. Rather, he has been using that card for political and electoral leverage, and with considerable effect on the domestic level. With regard to greater autonomy for the Republic of Srpska, to be precise, what he has urged was going back to the confederal arrangement set up in Dayton, which provides for an extremely limited central government and broad and virtually unfettered self-government for the Republic of Srpska as well as the other entity. It is not a question of pleading for a devolution of powers but of reinstituting the original system where most powers were vested in the constituent units, or entities as they are called, to begin with. It mirrored the status of the states in relation to the Federal Government under the original US Constitution, but that system was continuously diluted over the years by imperious decisions of dubious legality issued by EU’s viceroy in Bosnia, known as the High Representative. The single-minded thrust of those imposed decisions was to derogate the self-governing powers of the Republic of Srpska and centralize decision-making in the capital of Sarajevo. While there is no enthusiasm among Serbs for remaining part of the Bosnian state on any terms, for the moment the restoration of the loose confederal arrangement originally envisaged and agreed upon in Dayton would be regarded by them as satisfactory. Such a system would leave them with an ample degree of self-government in their own virtually independent state. They could largely ignore the unpalatable government in Sarajevo, and that government would have little effective control over them. Until the geopolitical balance of forces in the world changes sufficiently to allow more fundamental restructuring, such a system would be just fine with the Serbs. But, of course, it is a concept that clashes with the designs of NATO, EU, and the major players in the Western alliance. That is why they will have none of it and are staging another color revolution to install in the Republic of Srpska their own bought and paid for set of collaborators, committed to do their bidding.